Running a screen printing business for over 20 years we have learned a lot about the statistics of marketing. We got into the custom t-shirt business as a fluke, to fill a need. What we learned is that custom t-shirts are one of the top marketing tools out there. Due to their impact and recognition only parelled by their cost effectiveness. In essence, when it comes to custom t-shirts you get more bang for your buck as the return is amazing. A research company ran a test some years back to see the impact of a custom t-shirt. 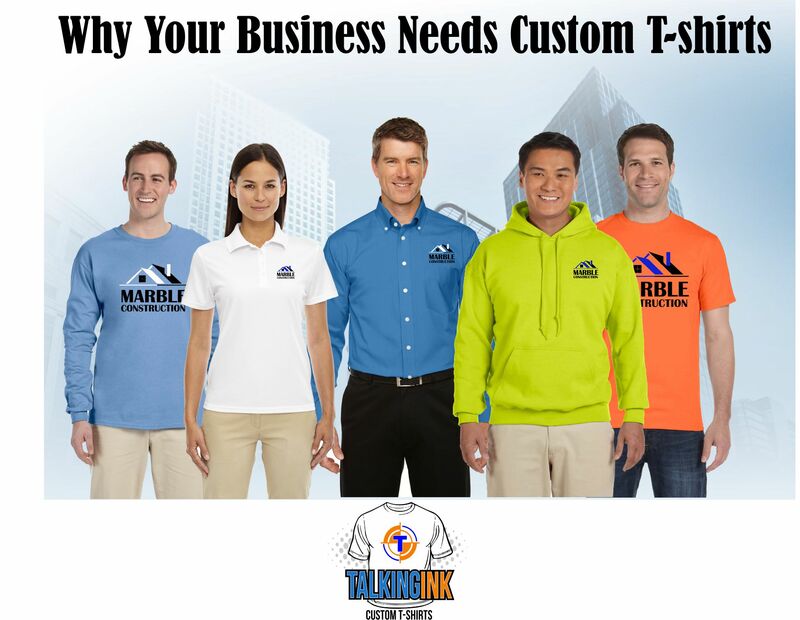 The results are why your business needs custom t-shirts. This company put specific t-shirts on a few people and had them walk around an average size town with a population of 25,000 residents. They ran this test on a week day and had these people visit various stores, restaurants, and grocery stores in the town. The next day the researchers polled various people in this town to see if they noticed these specific t-shirts. The results were an astounding 290 different people saw the different shirts. Meaning if there were 3 different t-shirts, over 800 people saw these shirts in one day. That is an amazing find for an item that costs very little in the world of marketing. The t-shirts were valued at $9/each. The reach they received for a $9 investment is truly amazing. How many of you reading this would jump at the opportunity to spend $9 in order to get 290 people to see your brand? My guess is just about everyone. This is why your business needs custom t-shirts. The cost verse exposure is something that just about all conventional branding methods can’t compete with. From a screen printing perspective there is nothing more satisfying than printed a dozen shirts for a small start up business. Then over the years seeing them come back time and time again ordering more shirts as their business grows. We print custom t-shirts and logo wear for all types of industries from small lawn care businesses to large corporate law firms. Since we carry a full line of apparel we can provide logo wear from custom tees to embroidered jackets, polos, and oxford button down dress shirts. At the end of the day it’s about the exposure for the investment. The cost per shirt compared to the exposure is very small. We recently ran a free online store for a local corporation that gave your employees a uniform allowance. We gave them options of very nice moisture wicking polos down to the traditional less expensive cotton pique polos. This was a smart move by this company because they now have their shirts on all of the employees who are in the field on a daily basis. But also those that sit in the office all day. For visitors it’s a more welcoming professional atmosphere to have there employees in a ton of different styles and colors of shirts, but with the company logo. Those employees will often visit local grocery stores, shopping malls, and other local places populated with potential customers. It’s a smart move to gain market exposure. It can be the 3 man lawn mowing crew wearing high visibility orange shirts that can be seen around town while there working. It can be corporation wanting to display a professional work environment. It’s all about exposure and the low cost per item for that exposure. Talkingink Custom T-shirts is a 20 year old screen printing business located in Saint Louis Missouri. To learn more about how we can provide you with logo wear for your school, business, or event, contact us and we’ll be happy to meet with you to discuss your needs.